Air Force Chief of Staff Gen. Dave Goldfein on Tuesday called on the service to return to its roots as a service that can quickly deploy and set up new bases — even under fire — as it prepares for future conflicts. In his keynote address to the Air Force Association’s Air Space Cyber conference in National Harbor, Maryland, Goldfein said that since 9/11, the Air Force has moved away from the expeditionary Air Force model unveiled in 1998 by former Secretary Whitten Peters and former Chief of Staff Gen. Mike Ryan. Goldfein called that model “a brilliant vision” that served the Air Force well in Iraq and Kosovo in the late 1990s. 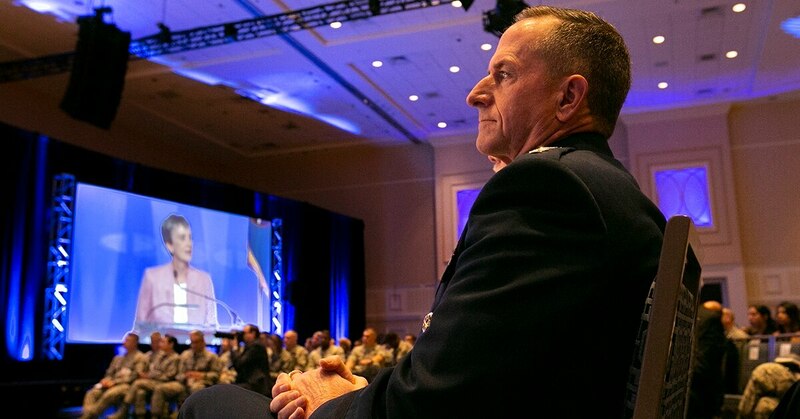 Today, Goldfein said, the Air Force has become a place that often “cannibalizes itself" to send forward small groups, or even individual airmen, to join mature campaigns with established leadership, basing and command-and-control infrastructure. That “muscle” is regularly exercised, Goldfein said, and the Air Force is good at those kinds of deployments. But that’s not going to be the case in a potential fight against peer nations with well established, modern militaries such as Russia or China. The Pentagon’s new National Defense Strategy focuses on what it calls the return to great power competition, and the Air Force is shifting its posture to be ready for such a conflict. Air Force Secretary Heather Wilson on Monday called for growing the Air Force from its current size of 312 operational squadrons to 386 by 2030, as it prepares for a possible conflict against a major nation such as China or Russia. That means the time has come again to return to a force that can go overseas and establish and defend new bases, receive follow-on forces, establish command and control, and fight from those new bases, he said — even while under attack. And instead of deploying in weeks or even months, the Air Force has to be ready to deploy within days, Goldfein said. Goldfein said the heads of the Air Force’s major commands will take the lead on updating the expeditionary framework over the next few months. This expeditionary need will drive leader development, talent management, exercises and inspection regimens in the future, Goldfein said.